For a complete Moscow trip, you'd better not to leave the city without seeing these places in the flesh. The most important and of course the most popular place in Moscow and even in Russia is Red Square. This world-renowned square is named after the red color, the symbol of communism. The Red Square has been the address of many festivals, demonstrations, public events for centuries. And also many executions. When you are in Red Square, you will have the chance to see the Moscow Kremlin, St Basilis Cathedral and Lenin’s, Stalin’s and Maxim Gorky’s Mausoleums which are all the top tourist attractions in Moscow and located in this square. The iconic landmark of Moscow is inarguably the Kremlin. Kremlin is actually the name of the complex located in the very center of the city. In the site, there are the palace, cathedrals, mausoleums and meeting halls and museums. It is also the official residence of the President of the Russian Federation and only some parts of it are open to public. You can visit Moscow Kremlin daily except for Thursdays between 10.00 and 17.00. 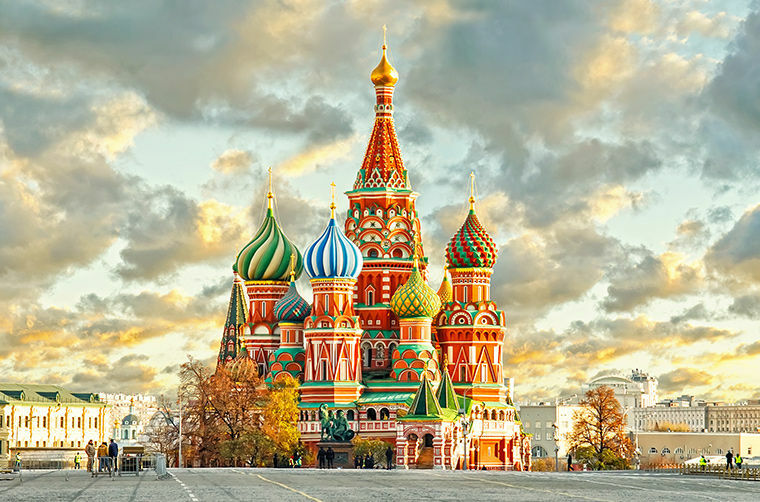 St Basil’s Cathedral, which is the most significant building in the city with its famous onion-shaped colorful domes is regarded as the symbol of Moscow. It was built in 1552 when Russians achieved a victory over Mongolians. Although its outer view is stunning, its inner decoration may be disappointing as it is not spectacular as its dressing. The Russian communist revolutionary and the politician, Lenin’s Mausoleum is situated in Red Square since 1924. His embalmed body is open daily to public for free except for Mondays and Fridays. Between 10:00 and 13:00. Located in the historical area of Moscow, Arbat is the most popular touristic street in the city. Dating back to 15th century, this street has so much things to tell you about Moscow culture. This vibrant street is full of restaurants, stores, street artists, cafes and souvenir shops. For shopping, (bargaining is almost a tradition here) dining out or experiencing the daily local life in Moscow you’d better haunt the Arbat. Being in Moscow in winter is a bit freezing experience but cold is not always that bad especially when it takes the shape of stunning pieces of art. Ice Sculpture Gallery showcases spectacular sculptures that are made of ice, all the year round. It means, even if you are there during white nights, you’ll have the chance to get impressed by these cool sculptures. Ice Sculpture Gallery is located in Krasnaya Presnya Park and the exhibition changes biannually. The sculptures depicts some remarkable scenes from Russian tales with the impressing effect of fabulous music and colorful lights.